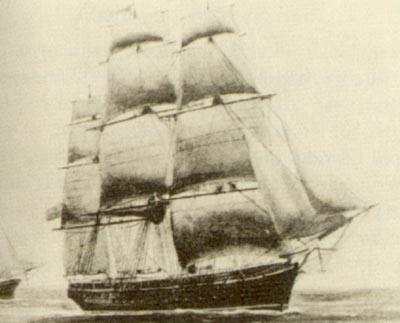 Type and Characteristics - Sailing sloop, built by Boston Navy Yard, launched 1844, sailed on 3 April 1844, 989 tons, 147ft long x 38ft beam x 17ft 2in draft, armed with 4-8in shell guns and 18-32pdr cannon, 210 crew, first commanded by Commander Henry Henry. Log Period and Areas of Service - 1852-55, East India Station, Perry's Expedition to Japan. 23 August 1851 - Departed Hampton Roads for service with East Indies Station. Later joined Commodore Perry's Squadron. 8 July 1853 - Entered Tokyo Bay for the first visit by Cdre Perry. 17 July 1853 - Departed Tokyo Bay. February 1854 - Arrived for second visit (most sources only have her making the first one). 1854 - Took part in a joint British-American landing party against Chinese forts in the Shanghai area, before sailing for the USA. 11 January 1855 - Returned to Norfolk before beginning duty in the Atlantic, including service as a midshipmen training ship during the summers of 1855 and 1856. Fate: Being repaired at Norfolk, VA at outbreak of Civil War, burned and scuttled 20 April 1861 to stop her capture by Confederate forces.